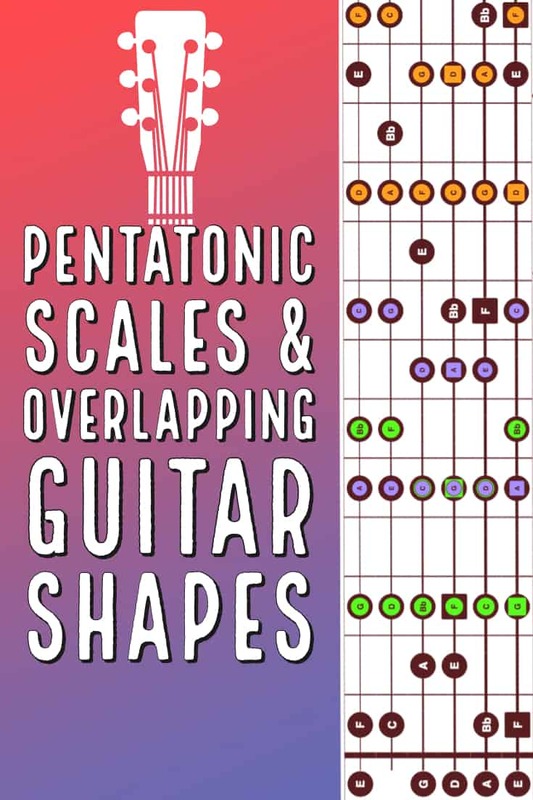 This week I’m going to revisit the Pentatonic Scale. Particularly the minor pentatonic scale and how it overlaps notes in it’s parent Major Key. 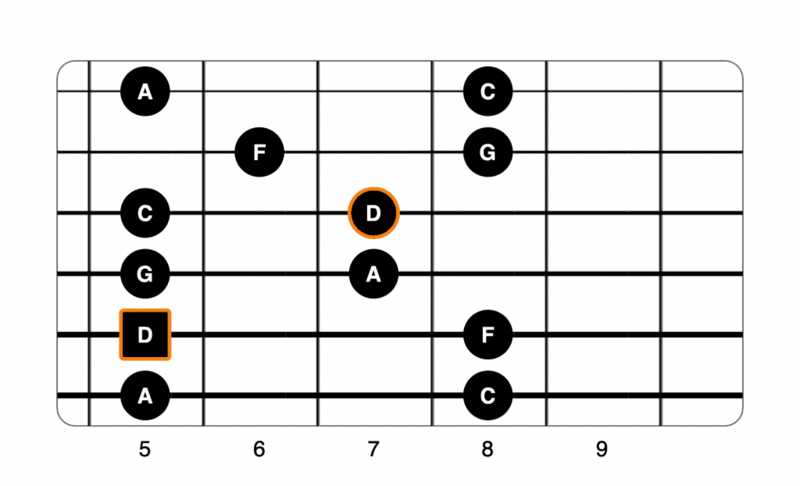 In case you missed it, last week I did a lesson on guitar modal scales and how they overlap. One of my readers, Tim, sent me an email right after that lesson went live and asked about the same concept using minor Pentatonic scales.. so like I always say… I get my best ideas from my readers. Tim, this one is for you! If you’re new to this stuff and want to take a quick refresher course, check out these recent lessons before you proceed. 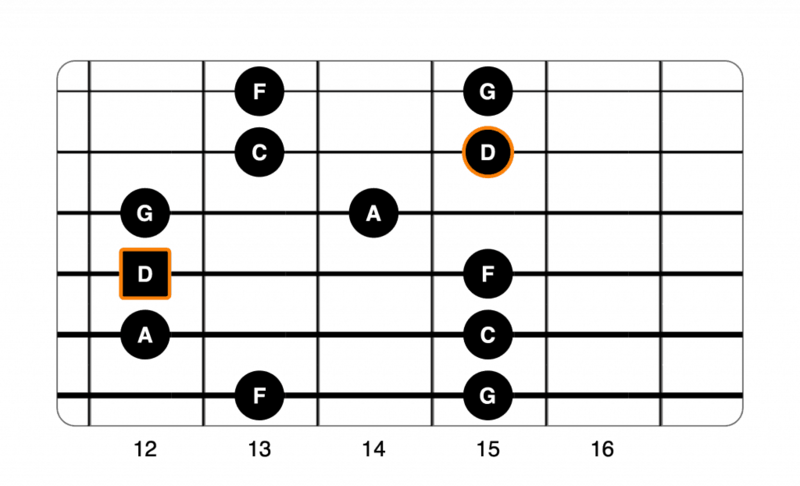 Guitar Modal Scales and how they overlap. Before we get started, let’s pick a parent key (Major Scale) from which to start. For this lesson we’re going to use the key of F Major (D minor). D F G A C = D minor pentatonic. Easy right? That’s really all there is to it. If you’re not familiar with the 5 Pentatonic shapes, let’s get that out of the way first. If you already know these, just scroll on down the page. Look familiar? 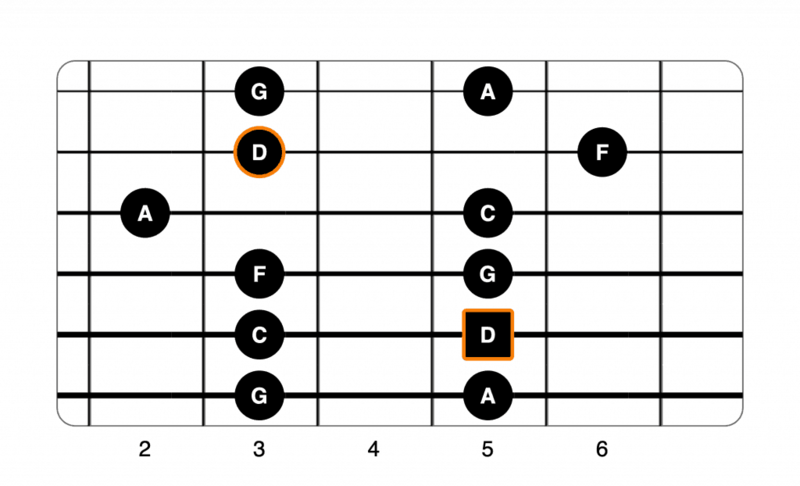 Chances are, even if you’re completely new to guitar scales you’ve probably fooled around a bit with this one. It’s the #1 most used scale in just about every kind of music that can be played on the guitar. Fun, simple, useful and easy to memorize. Notice this second shape the root (D) is on the D string, 12th fret. A good habit to get into when practicing these is to always start on the root, play through the whole shape and come back and end on the root. It’s a sure-fire way to get the shape memorized while also remembering where those notes are across the fretboard. Shape 3 starts with the root note on the A string. In my last pentatonic scale lesson I made a short video about how to get out of those first 2 shapes. The sad truth is, most guitarists only learn the first and second pentatonic shapes before giving up. 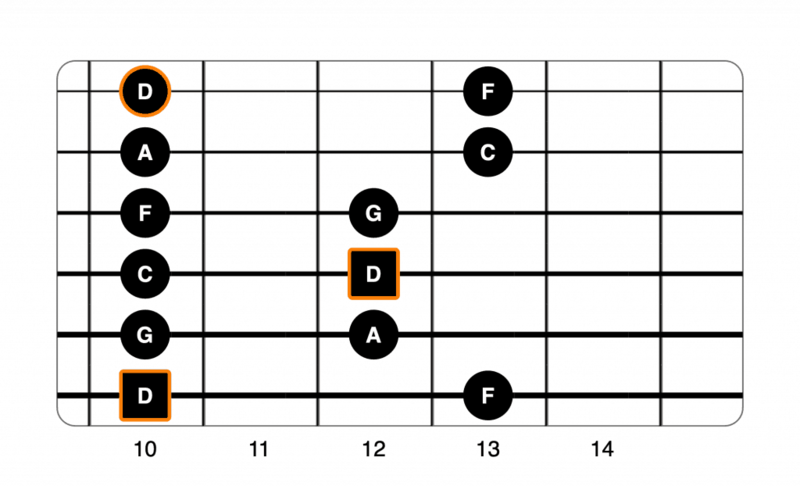 It’s worth the extra effort to learn all 5 and get them memorized across the entire fretboard. Shape 4 is very similar to shape 1. The way the guitar is tuned results in the offset on the 2nd string. That’s it! Now you’ve got all 5 Pentatonic scales mapped out in D minor. Well, not just F Major, really any key. In every Major scale we have 3 minor chords, 3 minor arpeggios and… you guessed it… 3 minor pentatonic scales! Editors Note: You may be wondering if there are also 3 Major Pentatonic scales in every key as well… YES. We’ll cover that in another lesson but the shapes and theory are pretty much the same. Just switch your minor root notes to those major ones and you’re good to go. 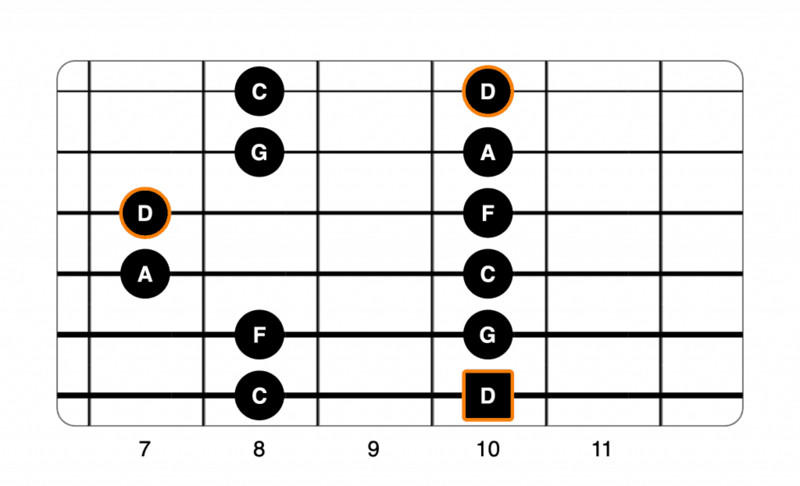 Now let’s take a look at just the first shape of G minor pentatonic (green), A minor pentatonic (purple) and D minor pentatonic (orange) overlapping the notes in the F Major scale (black). Pretty cool eh? You can do this with 3 minor Pentatonics in any key! Want to print this lesson out for later? Get a FREE high-quality (bigger diagrams) PDF mini-book of this lesson (and lots of others) in the Guitar Printables area. If you’re already on the list.. this lesson will be available in the downloads section by the time you read this! I realize this is a lot of graphic information to throw at you on one page. A good way to use these diagrams is to open your laptop, put your iPad on a music stand or print them out while soling over a backing track or jamming with a friend. After a bit of practice, you won’t need them anymore and you’ll be soloing all over the neck in any key. Now lets take only the minor pentatonic scale, in this case the A minor pentatonic, and overlay some minor chord forms across the neck. These are only a few but the ones I think are easiest to visualize. Remember: These patterns along with the chord forms will remain the same for any minor chord and pentatonic scale you use. Try it in G and D minor also. Ok, now that we’ve covered the shapes, overlays and even some chords in our 3 minor Pentatonics, lets put it to use over a minor blues progression in D minor. You’ve probably heard the term “1-4-5” (or I, IV, V) when referring to a blues form. The numbers indicate the degree of whatever scale the song is in. So if we’re in the key of F Major, a “1-4-5” would use F- Bb and C chords because those are the 1st, 4th and 5th notes respectively. 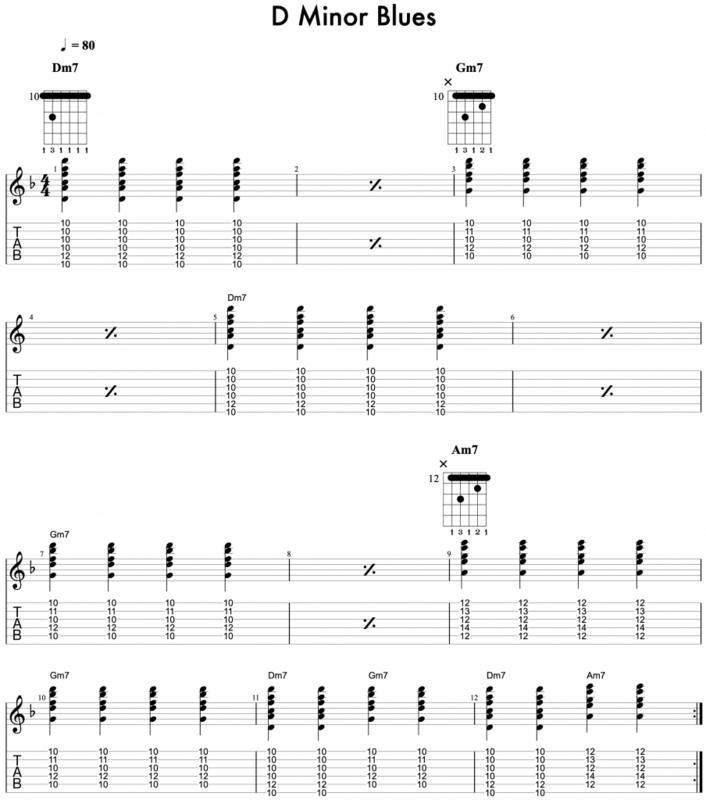 These could be dominant 7 chords, major or minor chords depending on the song. For this example, we’re going to use a 1-4-5 off of our relative minor – D.
If you’re new to these chords, work on each form slowly and work on the transitions. Record yourself using a looper or grab a backing track on Youtube. Improvise a solo using one or all 5 D minor pentatonic shapes above. 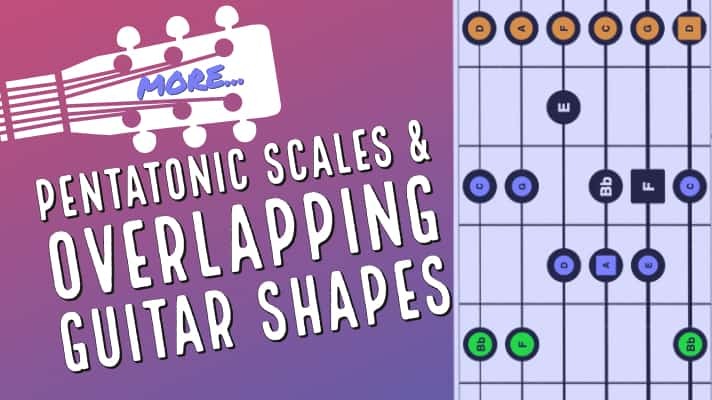 Once you’re comfortable, try using the same shapes in G and A minor pentatonic. Don’t forget, you can jump on my email list and get full access to the guitar printables & downloads area. I typically send out 1-2 emails a week with new free lessons and never spam. Unsubscribe anytime you like with one click! Fantastic lesson Craig! I’m definitely going to checkout out GuitarLayers!